Check out my website at www.jasoncastellente.com. Well, maybe not quite. But Behringer has been in the business of taking successful items from other manufacturers and making something very similar to it at a much lower price tag. Behringer has also been trying to bump up their quality. In fact, now so long ago, “The Music Group” which is the company that owns Behringer (CEO is Uli Behringer) purchased Midas and Klark Technik. That was a huge deal because Midas and Klark Technik are two highly respected companies in the audio industry and…well…Behringer, not so much. 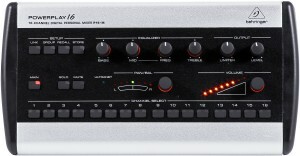 Just recently, Behringer announced their new lines of products for 2011 and it included a new version of their “Powerplay” series. Up until now, the model powerplay had been associated with a knock around headphone amp used for budget studios or ones that were on a tight budget and were only used as a quick reference headphone amp because they introduced so much noise into the signal. Now, it is a personal in ear monitor mixing system similar to what Aviom introduced years ago. There is a striking resemblance isn’t there? Very similar to what Behringer has done in the past with their pedals, mixers and amplifiers that has resulted in numerous lawsuits. I’m not saying that there will be a lawsuit over this, but I certainly wouldn’t be surprised. Let’s compare the two interfaces. They have very similar buttons on the bottom that are used to select the channels and they even have two lights on them probably one for selection and one to indicate if the channel is muted or not. In some videos I have seen, the button lights potentially may blink with signal being sent to them but I don’t see any solid documentation of that anywhere. 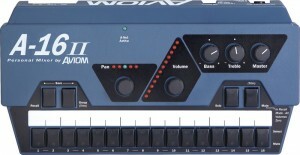 Behringer’s setup buttons are the first thing on the top left while Aviom’s are closer to the actual buttons. Behringer does have the option to link buttons together in the case of things like stereo inputs that are patched into two mono inputs and two P-16 buttons. Although, both units feature groups which to me seems like it will do the same thing as linking them on Behringer’s model. Maybe it has a different function that we don’t yet know about. I am intrigued by the fact that Behringer has included not only a mid EQ control but also a sweepable frequency control to go with it. Amateur musicians may not understand exactly how that works but I think you can figure it out once you play with it. That flex room in the middle of the tonal range of the mix is pretty key in my opinion. It is an option that has been lacking on the Avioms for years and I think it’s a great addition to personal monitor mix set up. Next up, the Behringer P-16 features a Limiter control that the Aviom A-16 does not. Whether this is useful or not depends on what it actually does and what it actually controls. If it is simply a hard limiter, then it is basically worthless because it will basically do the same thing as if you were to just turn the volume down. But, I would assume it works more like a compressor and the “limiter” control is effectively a compressor threshold which is tied to a preset internal ratio, attack, and release setting. This could potentially be helpful or a hinderance depending on how it works. The only way I could be sure of something like that is if I tried it myself. The second row of controls for the most part mirrors the Aviom controls with solo, mute, pan and channel volume controls. Now, for the most important part that everyone is probably wondering about: price point. The Behringer P-16 has yet to be released to the American market yet so there are no definite prices but there were list prices announced at NAMM that I’ll use here. So, if you have a worship band, what are the two price comparisons here. Let’s figure it out. First, before you read this, I decided to use the list prices for both since the official street prices of the Behringer series has not be released for the US. If I do a list price comparison, that will at least be a fair comparison. If you want a whole Aviom system with 8 monitor mixes, you are looking at spending $7,190 LIST. With the Behringer setup, you are looking at spending $2390 LIST. Okay, so what does this mean for the end user. Well, especially for church media, it will be very interesting to see how many churches decide to make the jump to the Behringer Powerplay system because of price point. Avioms can be pricey for some churches and I’ve talked to alot of churches who would love it, but simply can’t afford it. If this system works well, then maybe that is their ticket into personal monitor mixing. But, the downside is that Behringer gear is notorious for not being dependable and for introducing noise into signal chains. So, if that is a major issue, then maybe it won’t be worth it. Although, considering that the list price of an Aviom system is 3 times more then the Behringer, I’d certainly say, its worth a shot. We’ll see how well they work when they are released to the American market. Questions? Comments? Feel free to make YOUR voice heard. Comment below or email me at jason@jasoncastellente.com. That was really helpful. I look forward to getting my hands on the P16 and X32! Thanks for the comment. I appreciate you checking out my blog. If I get my hands on them, I’ll probably blog about it…haha so check back! has not been put your hands yet over the Behringer P16? 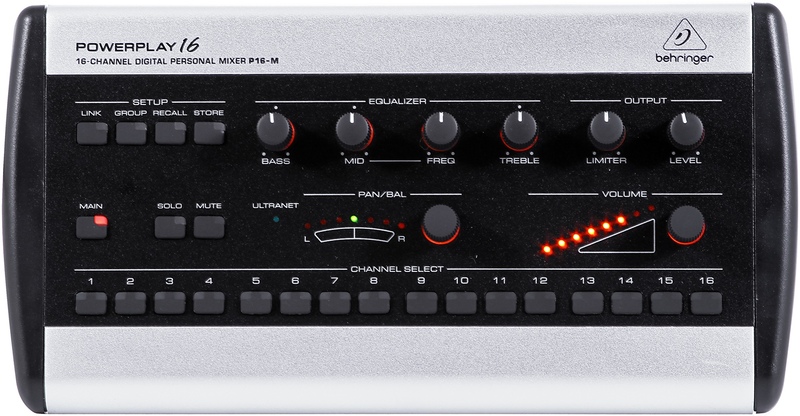 I was “googling” concerning personal mixers and I found the Behringer P16 system (and your blog too..) and it’s very instersting. My location is Guatemala and I attend a christian church; Im new about personal mixers but not to know problems between musicians and FOH mixer staff and also about stage sound issues ; thats the reason I’m searching about it. I haven’t found yet reviews about this product, however I know Behringer is not the top in audio equipments but the price for this personal mixers puts Behringer in the spotlight. Anyway, I think I’m going to suggest to my pastor to purchase a P16. On the other hand, your blog is interesting. Regards. Really interesting, found you on Google after finding out about this at a trade show. Any idea as to US/UK release dates yet as I can’t find anything on the web? Hey Ed, thank you for your comment. Behringer is never consistant with their release dates and from what I’ve always seen, they don’t pin themselves down to a release date in the first place. I’lll certainly blog again about it if I hear anything. Feel free to subscribe and check back for more info as I have it. It’ll be interesting to see if the Behringer personal mixer is compatible in the Aviom system after all they all use cat5. Might be a cheap way to expand on existing Aviom systems. I would highly doubt that. If Aviom were an open source, I’m sure there would be something available already. Also, I’ve heard about Behringer having some issues with the FCC and if it was compatible with Aviom, I’m sure things would have been easier for them. Hey Jason, enjoy the comments about this mysterious monitor system that exists somewhere? Does anyone know how to contact Behringer to be able to hold their feet to the fire? I love good customer service ,however,this company has been dragging it’s feet on a new product that is in demand and I’d like to share my thoughts with the man or woman in charge! Have them installed last week at my church and can’t wait to check them out on Saturday! I’ll let everyone know how they stack up against Aviom. I’m interested in finding distributors of this system. I saw it on Sweetwater but would rather look to a local dealer. What are all the modules needed for this system. Ideally we would need 8 personal monitors but right now could make do with 6. Have you used this system? Is it comparable to Aviom? I’ve used Aviom and liked it. I have also used SamePage which I really liked but the church I am currently at cannot afford those high dollar systems. Any further input would be appreciated. I haven’t used this system but I’ve been trying to get more information or a demo of some sorts. If you look at the specs on the Powerplay P16-i, it can handle 6 mixers directly from the front without using an extra hub. So you could get up to that 6 mixer count with just the P-16i and then 6 of the P16-M. Go to monoprice.com and pick up some TRS to TRS snakes to go from your console direct outs and the P16-i. You can also pick up decent quality cheap CAT5 cables on there as well so that you can connect your P16-M mixers to the P16-i interface. My church uses Aviom. It’s the industry standard at this point and there isn’t really anything else in that price range at this point that is as solid as the Aviom systems. Not to mention, my church has Aviom at 7 campuses so we’re bought into Avioms and I wouldn’t be able to swap out. A little while ago, I worked at a venue that had samepage and used it every day. It was okay. A little more of a pain then it was worth in my opinion. But still cool. I’d love to hear what your opinions are on the Behringer Powerplay personal mixer system if you ever decide to get it! HI, i have used avioms for years and just recently installed Behringer Powerplays…..WOW a total diference. If you are a musician and someone picks up a mic and u do not know what channel they are on…. it illuminates. Just like a sound board AVIOMS are DUMB in that way. no leds etc…. Behringer is a much better product. It way cheaper and sounds a LOT better . Also it has eq on all channels as well as overall . VERY nice feature. u can also click each channel and hit a switch and mute it easily. they took Avioms ideas and added many features. Simply put WAY better for me . I love the price we have used it very long hours and many months now and no problems no popps or cracking etc…. Dave, good luck trying to get this system anytime soon! I’ve been looking at it for nearly a year and all I ever get is it’s still coming! What I’ve been told is Behringer is still seeking fCC approval to be used in the U.S. I too would like to upgrade our church’s monitoring system and have enjoyed and used Aviom, but can’t afford that right now. If you hear anything new from Behringer please keep us posted. Phil, I’ll certainly keep my ears open for you and if I hear anything, I’ll let you know if I can! Im gonna say this…….. We had no ear monitor systems…… WE had used Avioms and installed in many churches…………… VERY expensive . We purchased one BEHRINGER feed box for $199 and it cost $250 per box for each musician….. WE lover our Behringer system Simply put……… It’s 100 x better than avioms. much clearer and very durable. LED lights make it easy to see who is singign if they pick up a mic and u dont know what channel they are on. Very much upgrade from AVIOM…. Id buy anohter one tomorrow and install if i had to. You can’t go wrong with the quality and price Behringer has really upgraded their products. I know 8 churches now using the Behringer and one even SOLD their Aviom system to pay for the Behrhingers.!!!!!! Finally an alternative to Aviom. I love aviom, use aviom. But we are looking to upgrade our youth band’s monoitor system and you know how it is for the youth band, they get the leftovers! haha, the question is, how many do they have? I can’t wait to hear what people think when they get their hands on them. We ordered it and are installing this week. I’ll let you know what we think…. You’re the first one as far as I know. I can’t wait to hear your review on them. I’d also love to get some info on what console you’re using and whether you’ve used any other personal mixers before such as Aviom, Roland, MyMix, Samepage, etc…. nice. I’ll follow the comments myself to see what you think. We are setting up a new site and have to buy all new gear. I think most of the people thus far have been purchasing them from Sweetwater. Everyone is out in their warehouses but guitar center had 4 of them in stores and we had one transfered in. It seems like the website for guitar center and the stores have different access to different items. We have everything but the mixing unit and it it supposed to arrive the first of next week. We will see. We have 8 in our newly installed system. Purchased at Full Compass. Tried them out this past Staurday and I’m pleasantly surprised! There’s features that Behringer has that Aviom doesn’t. Reverb is pretty cool. Green&Red LED for each channel.Green for input verification and Red for editing volume or whatever you need.I think they are very user friendly and can’t wait to figure out the rest of the bells and whistles. Just wanted to share the news with you all. Buddy, what about the quality of audio?? is there some noise? less dB’s? We hope your comments about it. Phil, what do you mean by “Reverb is pretty cool”? Are you saying the P16-M has a built-in FX processor? I haven’t seen indication of that anywhere else, but that would be awesome! Hi Lacho, Sound quality is very good in my opinion.We have a little AC noise in the audio ,but I think we can filter it out later. It’s not a big enough distraction at this point to worry about. Our sound tech loves it because he doesn’t have to worry about monitor levels anymore. Now they have more time to mix the mains instead! Thanks buddy! I have another question and I think you’ll need to ask to your sound tech, If my mixer doesnt have “direct Out” just “Insert”, Could I Use it? the difference between Aviom and PP16 is that… on aviom you have IN and REturn about the signal, but with PP16 you dont have return to the mixer if you Use INSERT… my doubt is if you can use INSERT as Direct OUT?? could He do a test? thanks! Sorry StringPark, I miss spoke about the reverb. There is not an onboard fx processor. It was coming from the main mix. Hey there! I really want this new system. Is volume ever an issue? How high do you usually run your output volume on the P16-M? I have a behringer headphone amp MA400 that I have to turn up all the way just to have a reasonable volume. I have seven of them. All the same. I would really appreciate the response. July is going to be here before we know it. X32 and P-16 are definitely going into the budget for next year. Will it be for a smaller auditorium or your main auditorium? What are you upgrading from? As to the method for using the inserts at each channel, that’s what I had to do with my Mackie mixer. By using a 1/4″ plug designed for stereo (tip, ring, sleeve) you can access the “send” portion of the insert of any particular channel to acquire the channel’s mic signal. The problem is that without the return to the insert, you break the audio chain so your mixer won’t have any input. The AVIOMs have a return jack to loop a signal back to the insert. But as in my case, I like to have that loop available to me as a line signal to my hard drive recorder. With that in mind, all you need do is connect the tip and ring tabs inside your 1/4″ plug and attach the mono signal wire going to your AVIOM or Behringer channel interfaces and you’ll have a signal for your monitor without breaking your audio chain at your mixer. Your Tascam should work exactly the same way. Pretty interesting in a review like this that there is no mention of the lack of Thruput on the Behringer 16-I. If there is no Thru that allows an unaffected signal to pass then it will be very hard to use in a professional situation. Professional studios and situations are already using the Direct Outs and Inserts to send to their DAW and Effects etc. I can’t believe Behringer dropped the ball here. I can’t believe there is no mention of it in this article. I understand that this is about the personal monitor but I had to point out to readers this glaring component to this system. Quick question about these units. I am wondering if I can buy up a few behringer 16s and use them instead of paying more for the aviom A-16 units.